Help sales managers give proper feedback to the sales reps, without overhead. Provide executives comfort and trust in the sales team and show effectiveness across the business. 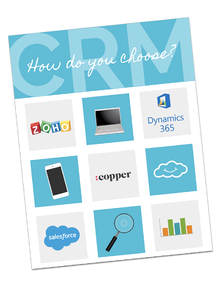 Ready to choose the right CRM for you? This 'Guide to Choosing your CRM' will help you explore the main differences between CRM software like Salesforce, Dynamics, Zoho, and Copper. Assess and optimize your business processes with ease. Cloudbakers’ experts will help you understand the ins and outs of CRM and teach best practices that power sales productivity.